The Historical Society of Monterey Park, located at 781 S Orange Avenue in Garvey Ranch Park, houses a museum with information and artifacts from old Monterey Park. They offer tours to students and guests through the year. The staff also provides speakers on historical events in Monterey Park and the surrounding cities. Paul Hubler, Director of Government & Community Relations from the Alameda Corridor-East Construction Authority and John Dietler, Ph. 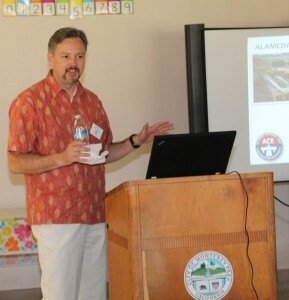 D., RPA, Culture Resources Program Director from SWCA Environmental Consultants were the guest speakers during the April 21 meeting. They spoke about their joint project of lowering the railroad tracks presently existing in the San Gabriel Valley and surrounding areas. They also explained the effect it will have on our traffic during this construction project. The San Gabriel Mission is located in the heart of their project so they took the audience on a tour of their project. Mr. Hubler introduced the Alameda Corridor-East that was created 14 years ago by cities in the San Gabriel Valley to provide safe railroads services from the ports of Los Angeles and Long Beach throughout the Los Angeles area and into the rest of our country. 40% of all goods shipped in the USA come from these ports with 60% of these goods shipped by rail lines from the ports to the county line. Since the railroads are already established with a 1% grade and the roads can be built with a 6% grade. Their job is to establish better grade separation from the tracks and roads. They also improve the sites for public safety. The freight service in the San Gabriel Valley is very lucrative so this project is very important to the neighborhoods. The railroad tracks are to be buried in front of the San Gabriel Mission since they are unable to raise the road due to the area. The best option is to lower the railroad tracks from Alhambra. A mile and1/2 of the tracks will be lowered 30 feet deep in a trench 65 feet wide. There will be four bridges over these tracks located on Mission, Del Mar, San Gabriel and Walnut Grove. Then the tracks will again be above ground heading east. Union Pacific owns these tracks that are also used by Amtrak. This project near San Gabriel High School will close the street for 6 weeks to construct the bridge. 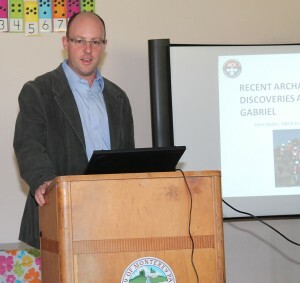 Dr. Dietker spoke about the history surrounding the 21 California Missions including the San Gabriel Mission. In 1771 the old mission was flooded out of the Whittier Narrows. In 1774 it was reestablished in San Gabriel on higher grounds. The water flowed down hill from the mountains. He provided a history lesson of the old mission, which established a ranch raising cattle, grains, vegetables and fruit to feed the people and animals who made the San Gabriel Mission home. In 1812 a gristmill was built using the force of the water to grind the grain for food. The design was poor as the water kept the grain wet. In 1820 Joseph Chapman, the first American to live in California, designed a better gristmill using his experience as a shipwright from Boston. His gristmill based on a style from New England used the force of the water to turn a stone to grind the wheat and corn, which did not get the grain wet. It was built on the original foundation of the original water line. It was 13 and1/2 feet high with grinding wheels. It was a much better system for the residents at the time. Several years later the gristmill was abandoned. The South Pacific railway later built their tracks over his gristmill and the streets were also built over the remains of the mill. In 2008 they began working with ACE to mark the sites of any and all artifacts from the old Mission grounds. A law guarantees that any and all artifacts must to excavate in the presence of a member of the tribe. They also opened their site to the public. In three months they located the remains of the old gristmill and other buildings under and around the tracks. They excavated 150,000 artifacts on the site that included 74,000 cattle bones and other miscellaneous articles including shells, hair pins, coins, belt buckles and pottery. They also recovered a human toe bone that the Tongva tribe buried in the mission gardens. A portion of Chapman’s Gristmill will be preserved and located in Plaza Park in front of the San Gabriel Mission in the near future. For more information about Monterey Park please call the Historical Society at 626-307-1267. 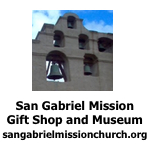 For more information about the San Gabriel Mission please call 626-457-3035.